Here on 16th June, 2016 we provide you Anti Corruption Court Gujranwala Jobs 2016 NTS Form Download Sample Paper. 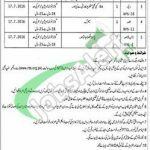 Jobs in Anti Corruption Court Gujranwala are available and it is looking for well educated, experienced, skilled and hardworking candidates having Gujranwala domicile for the following positions such as (Superintendent, Stenographer, Reader, Naib Qasid and Almad). Appointment of these positions will be held on contract basis and duration of contract is extendable on satisfactory performance of individual. Candidates willing to apply for these positions should possess relevant qualification and experience as per the criteria mentioned in the following image such those for Sr. No. 1 and 3 Graduation is required, for Sr. No. 2 Intermediate is required and for all other positions Matric and middle pass candidates can apply. So, viewers if you possess all above mentioned requirements then you are welcome to apply as per the following how to apply procedure given below which is according to the rules of NTS. Duly filled application form along with original paid deposit slip of test fee which is Rs. 500/- in favor of NTS and all other documents should reach the following address given below. Last Date for submission of application is 02nd July, 2016. Written test will be held on 17th July, 2016. Qualified candidates from NTS test should bring original documents at the time of interview. For more quality jobs please stay in touch with us at JobsAlert.pk. Last Date to Apply: 02nd July, 2016.